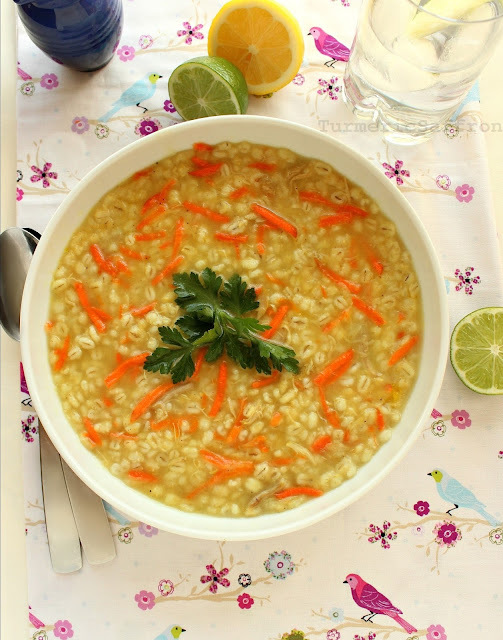 This is a healthy and delicious سوپ جو soup-e jo (barley soup) recipe with chicken, carrots and a good squirt of fresh lemon juice. This is the kind of recipe that I would highly recommend to college students living away from home that are tired of eating campus food and unhealthy take-outs. 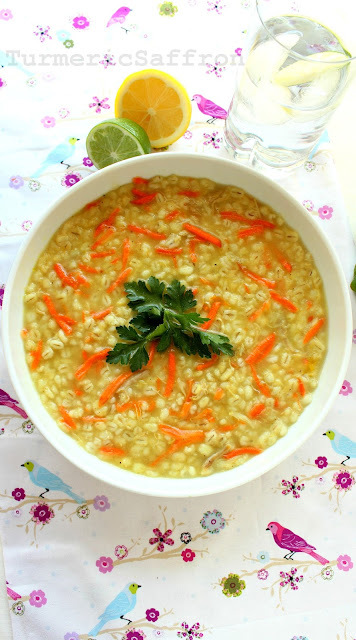 This soup is easy to prepare and there aren't too many ingredients. All you need is access to a working stove, a little time and a good dose of enthusiasm. It's officially spring but the pleasant spring weather has not arrived yet! For my first post of the new season I would have liked to prepare a light dish with fresh vegetables but I'm still waiting for that exhilarating moment to be able to open all the windows and let the fresh air fill the house and to feel the arrival of spring all around me. I can't wait to put back my outdoor bird houses and wind chimes around the house that I had brought inside before the Sandy Storm last fall. Spring is such a short season here in New York, it arrives late and is gone before you know it. While I was growing up in the southern region of Iran, early spring meant beautiful weather and gorgeous landscapes with wild flowers. One of my springtime memories goes back to یک روز بهاری (one spring day) when I was a seventh grader in our small town of Masjed Soleiman in Khouzestan province. I watched a flock of wild parrots pass over our house in the early hours of the morning. 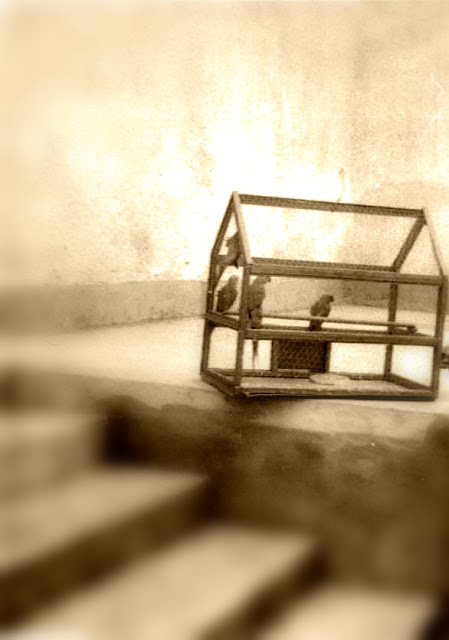 I don't know where they were traveling to or where they were coming from but my father, who loved birds and at one point had about two hundred birds and possibly more had my mother not objected, suggested catching those parrots and excitedly I went along. The next morning, at the crack of dawn, I watched my father bring out an old mesh wire cage and place it by a large open window. He tied a long string to the little latch on the opening of the cage, placed some seeds inside with a trail leading out. We waited patiently as a couple of parrots from the flock approached our house and one of them followed the seed trail into the cage. My father pulled the string and closed the door on the parrot. It was a thrilling moment and the joy continued for the next few days until we had eventually captured five beautiful parrots. Several days later I came home from school joyfully refilling their water bowl and giving them more seeds. Things seemed calm in our household and my mother appeared to be going along with our little hunting escapade. However, she apparently tolerated the whole situation for as long as she could and one day while I was still at school she took the cage out in the back of the house over the hills, opened the cage-door and let the wild parrots out in the middle of nowhere. To my horror I found the cage empty on the lonely porch. I think I went through each stage of grief except the last one, acceptance, in the span of ten minutes before I headed down to the kitchen where I knew she would be. I don't remember what I said, it's all a blur, but I remember what she told me: پرنده جاش تو قفس نیست (birds don't belong in a cage!) "Birds need to be free and to be able to go wherever they wish to go," she said. Through our heartfelt connection I understood what she meant and to this day I am still learning the depth of that poignant lesson. Arrange the quartered onions at the bottom of the stockpot, add the chicken, celery, garlic, bay leaf, turmeric, salt and pepper. Add enough water to cover all of the ingredients, bring to a boil on medium-high. Reduce the heat, cover and cook on medium-low heat for about 45-50 minutes or until the chicken is fully cooked. Remove the pot from the heat and let cool. Drain the soup and pour into a bowl for later use. Separate the chicken from the bones and shred into small pieces. Place the soaked and drained barley in a large pot, add the strained chicken soup and enough water to cover up to 3 inches. Bring to a boil for a couple of minutes on medium-high heat, reduce the heat, cover leaving the lid a little ajar and cook for 45 minutes. To the pot add the shredded chicken and the shredded carrots, stir. Add more hot water if needed. Cover and cook for another 40- 45 minutes on medium-low heat. In the last 15 minutes of cooking add the lemon juice, taste and adjust the seasoning. 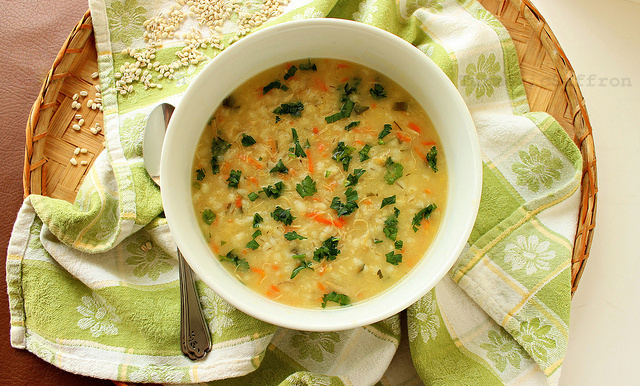 Serve the soup in a large bowl, sprinkle chopped parsley on top and serve with warm bread. 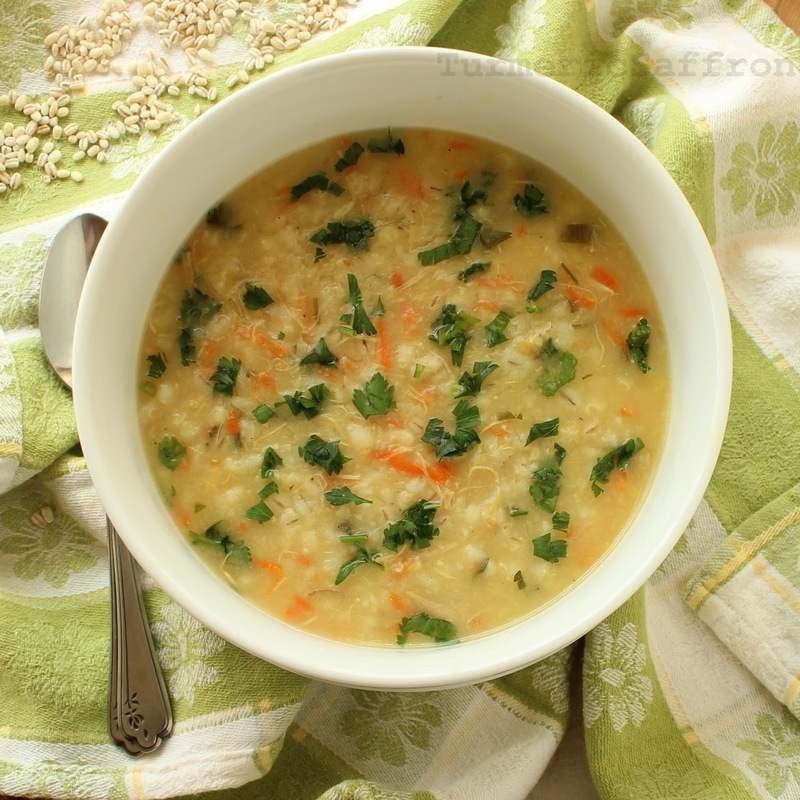 Note: All the soup pictures are taken from the same barley soup. The first two were taken with little liquid and freshly shredded carrots on top to show the ingredients. The last two photos are from the soup filled with liquid. My mom always made us Soup-e-Jo when we were sick growing up, so comforting. What a lovely story and the ash looks so lemony fresh. I, too, lived in Khouzestan province. With my persian husband and 2 children, we lived in Ahvaz, Omidieh, and travelled extensively in and around that area back in 1976-78. I love persian food, and cook most of it. Thanks for reminding me of this favorite soup! Beautiful recipe and photos. My daughter loves all Persian soup recipes, but I have a feeling this is going to be her new favorite. Definitely going to be making this very soon. Daste Shoma dard nahkon! Wow, in Poland we have very similar soup. We don't, however, use lemon juice neither turmeric but I like (like many Polish) to add some dried mushrooms (like porcini, ceps) to taste. Im having a terrible day at the office here in Geneva and cant wait to go home to make this lovely soup my Khaleh Mansoureh would make me in Iran. Thanks for sharing!! Sorry to hear that and I hope you enjoy the soup. One of my faves. 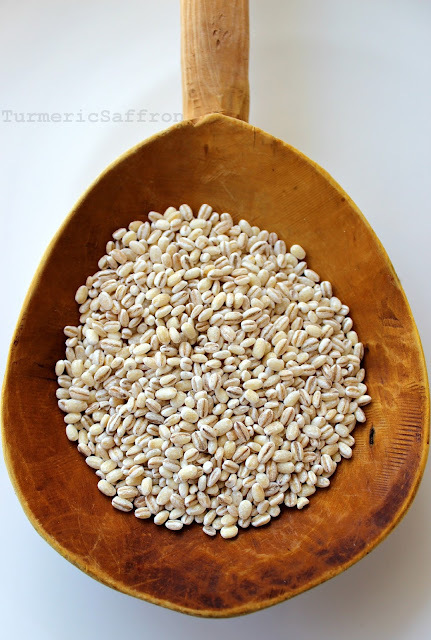 I love Persian Barley soup my Persian Friends make for me when I visit them. I am going to try it and surprise them. Thanks for the recipe.